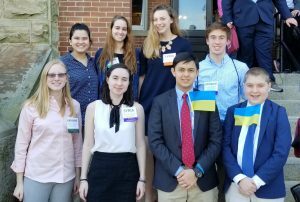 BE Model UN did an amazing job representing Syria and Ukraine at Winthrop’s Annual Model UN Conference last week. Joey, Micheal, Sarah, and Luther wrote resolutions that qualified for the list of choices to debate in their committees. Additionally, Finley won an award in her committee. All of them debated well, learned about International Relations, and made BE proud!